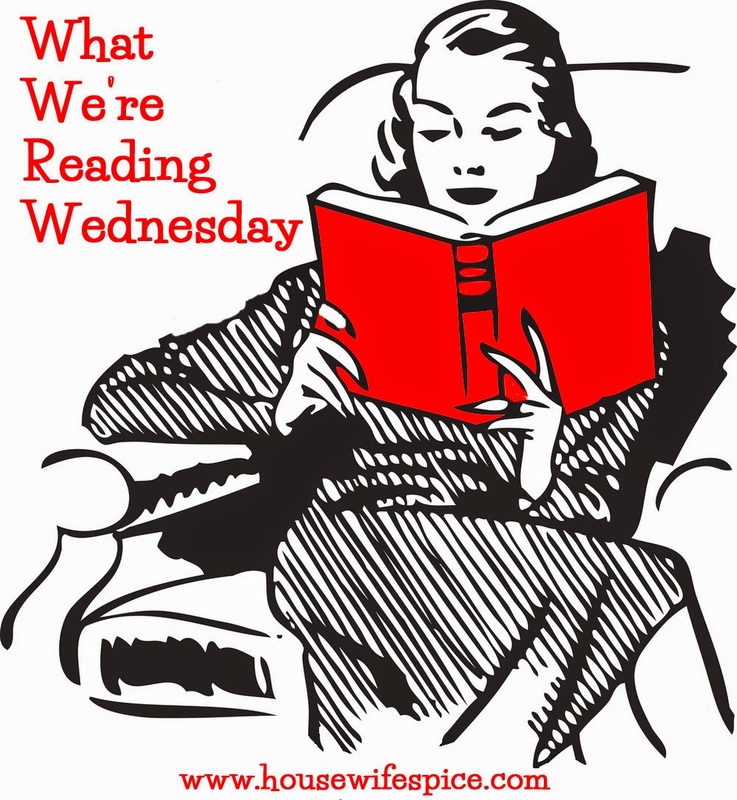 I’m linking up with Housewifespice for What We’re Reading Wednesday! Maybe I should call it What I’M Reading Wednesday because I don’t know what else anyone else is reading. John usually has about five books going at once. Emily reads about a book a day. She visits the library regularly, and Young Adult is her favorite genre, especially fantasy. As far as I can tell, the only thing Jake ever reads is Tolkien. Teddy has not read for pleasure (to my knowledge) since the last Harry Potter book came out. William reads all the time, but not books. The computer provides his information. Lorelei would rather watch t.v. than read. Where did I get these children? So here’s what I am reading! I finally started reading this (after it was already overdue at the library . . . sigh). It’s the story of a love affair between an intellectual and sophisticated widow and a divorced devout Catholic man. This is set (I presume) in the 50s, when annulments were rare and in his case hopeless. He has just asked her to marry him and as yet she does not know what this means for him. I don’t see this one headed for a happy ending, folks. The prose is beautiful and the story is interesting. It’s told from the woman’s point of view, and her hostility toward the Church, her inability to comprehend it and her lover’s relationship to it, are fascinating for a Catholic to read. This is a Janice Holt Giles novel, posthumously published because it was considered too controversial at the time it was written. In these times, it seems quaint. Yes, I really did read the whole opinion in the Hobby Lobby matter. I did not want to weigh in on the debate based on either personal belief on the underlying issue or headlines I read on the internet. It’s about 90 pages long and I encourage you to read it too if you want to have an informed opinion. Finally, I just finished reading Michelle van Loon’s book on regret. Please read my reflection on it here, and you can also enter my giveaway for you own copy by commenting on that post. The giveaway ends tomorrow, and entries have been few so your chances are really good! Looking for more great reads? Check out the rest of the linkup here! Rilla is perhaps my favorite LMM book. I did read it as a young teen and bawled like a baby. Maybe this was the first book to make me cry? I wished and wished and wished that my big girls would read the Anne books, but I’m afraid it will never happen. sigh. I hate that there are books I loved as a child that my daughter won’t read–or perhaps what is even worse is when she does read one and doesn’t like it! I’m planning to reread the Anne series this summer, too! I liked Rilla of Ingleside a lot better as an adult than as a kid, but I’m still just much less interested in the books when Anne sort of fades to the background. I found Act of Contrition at the library–it’s a fairly new release so you might be lucky there. Also, I saw there is another Anne book I haven’t read. I think it’s called “The Blythes Are Quoted” and it’s poems and stories that the Blythes are all supposedly relating to one another in the evenings. Sounds interesting. Maybe it’s me but I cannot just simply read the comments unless I write my name, email address & a comment & then submit. And if I forget my password I have to begin again. Does everyone have to do this or is there something I am not doing? Word press us not usually making you sign in to just read comment sections on other blogs . I’ve never seen that happen but I do have one other friend who can never comment at all. I don’t get a lot of comments and if that’s true for everyone I can see why! I’ll have to check it out.